Robert Nelson was born in Phoenix, Arizona in 1941, but grew up in the Midwest. He began piano lessons and made his first attempts at composition while still in grade school. In Junior High, he took up the trumpet and eventually achieved first chair in his high school band. During his senior year he began playing both trumpet and piano in local dance bands, an interest that he pursued throughout college and his professional career. He began serious composition study with Robert Beadell at the University of Nebraska, where he received his Bachelors degree with a major in music education and his Master of Music degree. He continued his composition studies with Ingolf Dahl and Halsey Stevens at the University of Southern California, where he earned his Doctor of Musical Arts degree with a major in composition. While at USC, he performed in both the Wind Ensemble and the Orchestra. It was during his studies with Dahl that he first expressed an interest in writing opera, and he was subsequently invited to study opera as a coach/conductor under the tutelage of Walter Ducloux. In 1968, he joined the music faculty at the University of Houston, which would eventually become the Moores School of Music. He is currently Professor Emeritus of Music Theory and Composition and co-author of five widely adopted music theory books. As a composer, he has always been interested in music for film and theater as well as for commercial and popular venues. He was active for many years creating advertising jingles and during that time composed the scores for numerous industrial documentary films. His most ambitious project was The Apollo File, a documentary film detailing the history of the Apollo moon missions. His theatrical activities include a long period of collaboration with the Festival Mime Troupe of the School of Theatre at the University of Houston and its brilliant director Claude Caux. This collaboration resulted in a significant number of works in a wide variety of musical languages and written for a diversity of ensembles. He served as musical director for a number of Broadway musicals produced by the School of Theater. He served fifteen seasons as musical director and composer-in-residence for the Houston Shakespeare Festival, during which time he composed original scores for nearly the entire canon of Shakespeare’s works. He was also commissioned to write original music for several productions by the UH School of Theatre including a new score for Berthold Brecht’s The Caucasian Chalk Circle. He has also been commissioned to compose incidental music for productions at Houston’s Alley Theatre. He has written five operas, the most recent being A Room With a View, with a libretto by Buck Ross. A DVD of the recent Moores Opera Center production of this opera is available from Newport Classics. His one-act opera Tickets, Please, with libretto by Sidney Berger, was commissioned by the Texas Opera Theatre and has been performed frequently in the United States and in England. His interest in dramatic music is evident in several of his major choral works. Nicholas of Myra: a Choral Triptych, with a libretto by Sharon Shepley, was developed in collaboration with Charles Hausmann, the Director of Choral Activities at the Moores School of Music. Hausmann wanted a large piece in an operatic style that involved the chorus in both solo and ensemble music and could be performed with minimal staging. The resulting piece is structured as a Prologue detailing Nicholas’ youth and three major sections, suggesting the panels of a medieval altar painting. Each “panel” tells one of the traditional stories of Nicholas’ life. The Things We Have–in Memoriam: September 11, 2001 was commissioned by the Houston Bach Choir and its director Robert Lynn. As befitting the subject, biblical texts of a very dramatic nature were chosen. In neo-Baroque style, it utilizes a hymn tune, Martin Luther’s Erharlt Uns, Herr for which a new text was written by Patricia Clark. The Lovely Light, for seven female soloists, women’s chorus, and chamber orchestra, was commissioned by the Tuesday Musical Club for the occasion of their centennial. The libretto was written by Kate Pogue and celebrates the artistic contributions of women to the arts from the time of Sappho to the present. He has received numerous commissions from the Houston Symphony, including The Little Match Girl, for narrator and orchestra,and Rondo Concertante, the last a piece featuring the principal players of the orchestra, and written for a special educational video produced by the symphony. Old MacDonald's Orchestra, written to introduce young people to the instruments of the orchestra, has been performed by the Pittsburgh, Baltimore, and Milwaukee symphony orchestras. Suite Joplin has been performed by the Saint Louis Symphony, the Baltimore Symphony, and the orchestra of the University of Tucuman in Argentina. 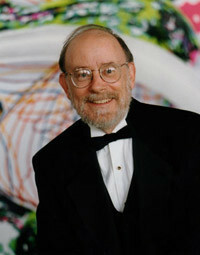 His interest in combining classical and jazz elements has found expression in many of his works, most prominently Up South, written for the combined Moores School of Music Orchestra and Jazz Ensemble, and Impressions/Expressions, a jazz-based two piano piece written for Tim Hester and Ruth Tomfohrde. A fusion of classical and popular idioms is also found in Shadows and Music, an extended song cycle for soprano, mezzo-soprano, violin, and piano. The original text for this work was written by Buck Ross and is based on the lives and careers of Dorothy and Lillian Gish. All three works are featured on the Albany CD entitled Shadows and Music, which also contains his arrangements of Creole songs featuring the mezzo-dramatique Débria Brown. His solo and chamber works reflect a deeply held conviction that the music should be tailored to the talents and character of the particular performers, and he has been fortunate in having the opportunity to write for a diverse and outstanding roster of singers and instrumentalists. 2x2, a four-movement quartet for two violins and two cellos was written for the remarkable McAdam-Somer siblings. Eden and Ian are particularly adept at improvisation so they were afforded opportunities within the piece where they could demonstrate their improvisational technique. His Quartet for Clarinets was composed for the Quartetto Italiano di Clarinetti, four professionals from various cities in Tuscany who have toured worldwide. Aaron Lington, a superb baritone saxophone performer, currently the director of jazz studies at San Jose State University, premiered his Concertino for Baritone Sax and Orchestra and Odysseus, a piece written expressly for him and premiered at the US Saxophone Congress. Zoo Stories, for mezzo-soprano, horn, and piano, with original stories by Kate Pogue, was commissioned by hornist Eric McIntyre for an improvisational ensemble in Grinnell, IA. All performers participate in narrating the stories and are required to do a certain amount of acting! This piece has recently been recorded. His Suite of Characteristic Dances was written for clarinetist Robert Walzel. His Divertimento for clarinet, cello, and piano was commissioned by clarinetist June Garrison. Capriccio, a piece for solo violin and orchestra written for Andrzej Grabiec, and Elegy: the Finest School, for tenor and strings, written for Joseph Evans, have been recorded for a new CD. He is currently working on an extended suite for narrator, singers, and orchestra based on the poetry of Robinson Jeffers commissioned by the Monterey Bay Symphony Orchestra. Over the years, he has developed on-going relationships with a number of performing ensembles that have resulted in numerous significant compositions and arrangements. He has been associated with the Houston Boychoir for nearly twenty-five years during which time he has created numerous arrangements, including a series of Texas-Western tunes that have become a staple of their touring repertory, and an opera The Selfish Giant, based on the fairy tale by Oscar Wilde, with libretto by Sharon Shepley. An association with the Virtuosi of Houston, a select youth orchestra conducted by Franz Anton Krager and Andrzej Grabiec, has engendered over a dozen arrangements of popular and jazz standards that Krager has subsequently taken all over the world, most notably to the Orchestra Sinfonica Città di Grosseto. He worked extensively with the Chicago Chamber Brass during their last years, and has embarked on a productive association with VOX/The Rob Seible Singers, serving as an artistic adviser and composer-in-residence. The premiere CD of this group featured his music.